Kingsdown, Inc. – Virginia – GreenTech Solutions Group, LLC. 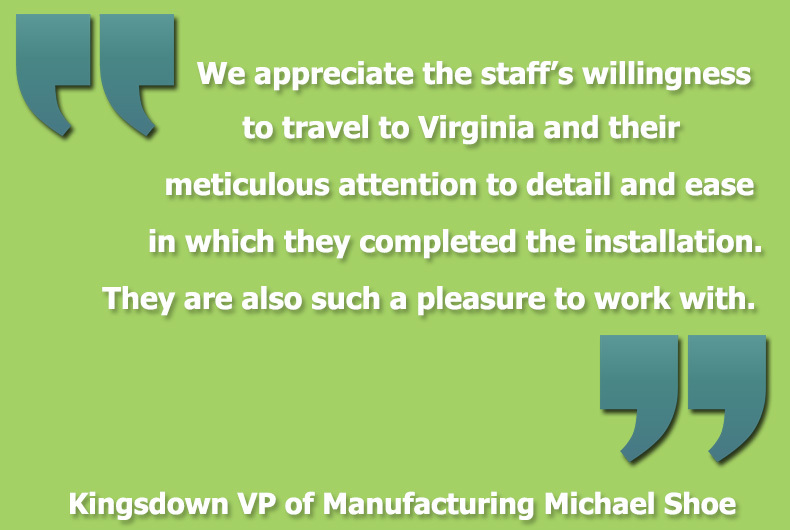 Kingsdown, Inc. was looking for additional ways to save energy and money in its Winchester, Virginia mattress manufacturing plant. Kingsdown has been handcrafting luxury mattresses since 1904 in North Carolina. The company prides itself on creating the world’s smartest luxury mattress backed by research, data collection, and extensive testing. Kingsdown VP of Manufacturing Michael Shoe was looking to improve the exterior lighting quality and decrease energy consumption for the plant. He also wanted a solution that would reduce the time their employees spend maintaining and repairing the exterior lighting system. Shoe worked with GreenTech Solutions Group on the LED lighting upgrade of its entire Mebane, NC manufacturing facility and corporate headquarters previously. That upgrade was very successful and the entire installation went so smoothly that Shoe was eager to have GreenTech upgrade the exterior lighting at its Virginia plant. GreenTech carefully assessed the existing lighting fixtures of the building’s exterior and provided a detailed analysis and forecasted the energy and additional maintenance savings that result from upgrading to energy-efficient LED lighting. The exterior lighting upgrade around the Kingsdown plant resulted in a 69% reduction in annual lighting energy usage consumed by pole lighting, wall packs, and down lights. LED lighting increased the light levels over the outdated system Kingsdown used for years, which drastically improved employee safety around the building and in the parking lot. Metal halide fixtures on the perimeter walls were replaced with 120-watt LED retrofits and 65-watt halogens were upgraded to LED wall packs. The halogen front entrance light was changed out for a 10-watt LED down light. Metal halide pole lights were also swapped out for 150-watt LED pole lights. The effect of the outdoor lighting upgrade was a brighter, safer environment for employees and visitors to the plant. Since LEDs have a much longer life than traditional lighting, Kingsdown will save significantly on maintenance costs of renting lifts and replacing hard-to-reach light fixtures due to failures. This allows the company to save both time and money by eliminating the intermittent costs needed to maintain a fully-functioning exterior lighting system. GreenTech staff installed various types of lighting, depending on the needs. Some of the exterior lighting was continuous and others were dusk-to-dawn fixtures, which made the switch to LED lighting more advantageous to Kingsdown’s bottom line. Replacing legacy metal halide and halogen lights and fixtures with LED lighting can make a big difference in the expenses, effectiveness, and aesthetics of a company’s facility. The lighting upgrade also has a quick 2.9-year payback. Kingsdown once again proved its commitment to helping the environment by doing what it can to reduce the company’s ecological footprint. The LED upgrade to the exterior of the building will save 43,984 kWh each year, which is the equivalent of planting 25 acres of forest, seven fewer cars on the road, or 3,493 fewer gallons of gas consumed.